Paula Shalan’s hand-built ceramic pieces reflect her fascination with ancient objects and with the imperfect beauty of nature. 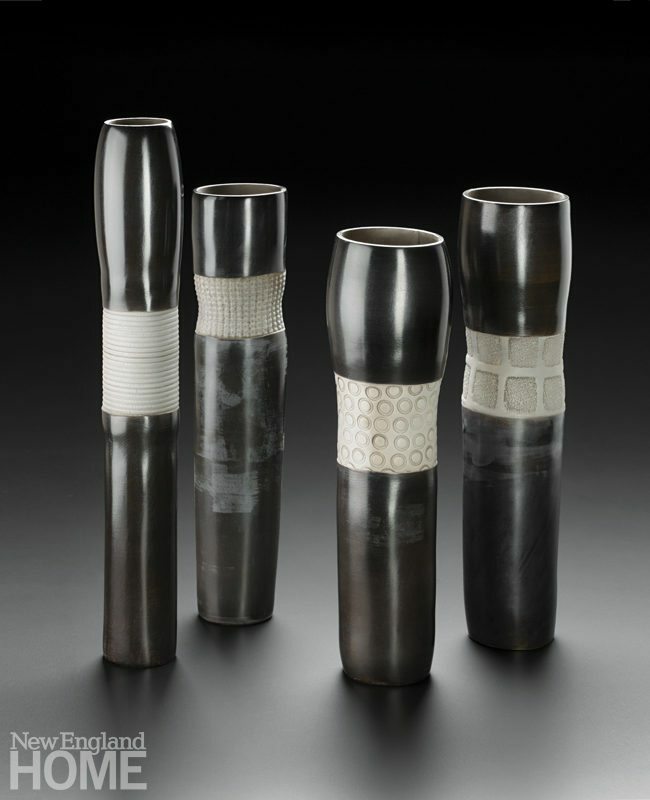 Smoke Fired Slab Vessels with Colored Stripes (2016), white earthenware, polished fine clay slip, colored slip with sgraffito, 15½″H  5″W, 15¾″H  4¾″W, 16½″H  5½″W. When Paula Shalan was working on her master’s degree at the Art Institute of Chicago, she found herself preferring to spend time not in the museum of art, but in the museum of natural history. She filled her notebooks with sketches of African baskets and Mimbres pots, and slowly realized that, while she may be a modern person making fine art, she is drawn primarily to things that are ancient and come from the earth. So it makes perfect sense that today she works quite literally with the earth, and the ancient tradition of clay. Shalan grew up in the Boston suburb of Milton. There’s nothing suburban, however, about her approach to art. That’s because she lived on thirteen acres of fields and woods, and spent her days touching and observing the dirt, rocks, and trees around her. Today Shalan works out of a small studio behind her house in Stockbridge, Massachusetts, with two walls of windows that look out on fields and streams. The shelves are filled with beautiful works of ceramic art, but also with boxes of natural objects: polished stones, coral, bones. The space is white, bright, and remarkably clean for a ceramic studio, and she wears not a clay-stained smock but a clean red sweater—one advantage to not using a wheel. 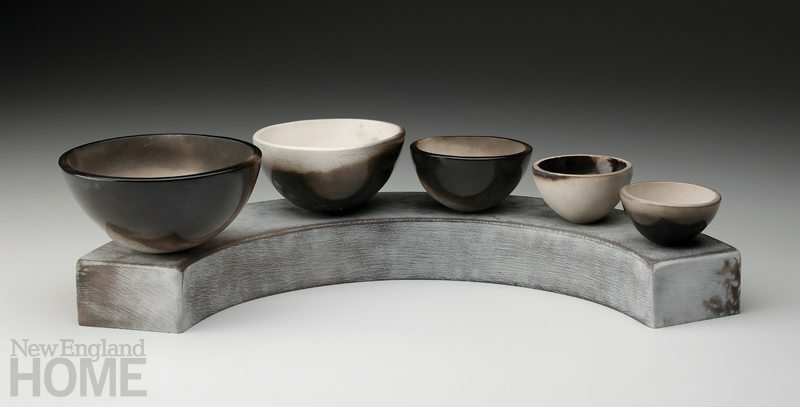 She forms her pieces entirely by hand, using the same low-tech methods as potters did thousands of years ago. A big, wide bowl seems as perfectly round as if it were turned on a wheel, but she pinched it together with wide coils. 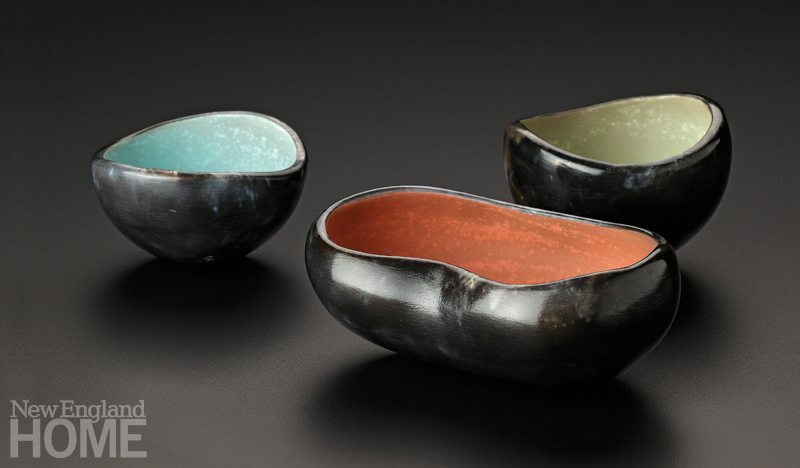 A major feature of her work is the shiny black surfaces that look glazed but are actually created with a technique used for thousands of years by Pueblo potters. She carefully sands a piece, coats it with a slip of fine clay particles called terra sigillata, and polishes it to a sheen. She wraps it in newspaper and tinfoil, “like a baked potato,” sets it among wood shavings in a fire box behind her studio, and lets it burn and smolder for about a day. This carbonizes the surface of the clay into a rich, glossy black. Shalan’s works are inspired by ancient people, materials, and methods, but they are not reproductions in any sense. She takes in what she calls “visual data” from the past and the present and synthesizes it into something that is ancient and modern, emotional and peaceful. To see more of Paula Shalan’s work, visit paulashalan.com.